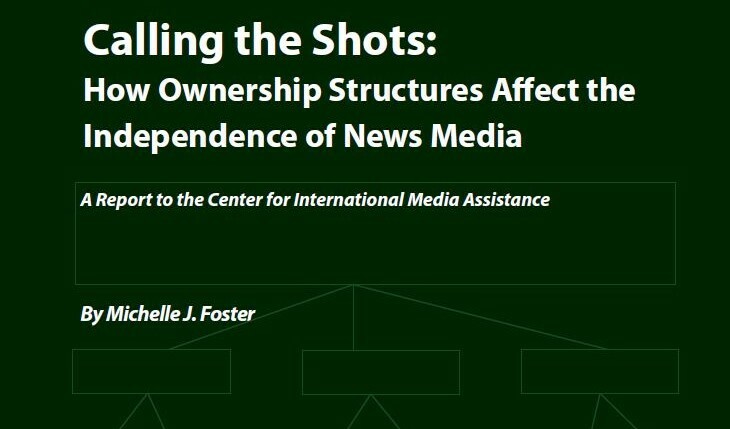 CIMA announces the release of its latest report, Calling the Shots: How Ownership Structures Affect the Independence of Media, by Michelle J. Foster, a veteran international media management and marketing consultant and former Knight international journalism fellow in Southeast Asia. Around the globe, traditional news media–newspapers, magazines, and broadcast networks–are operating in more concentrated environments with fewer owners and less diverse voices. This has adverse consequences for the ability of citizens and communities to hold their governments accountable. If media cannot be free and competitive, it can be neither plural nor diverse. Who owns the media and its infrastructure and who controls its sources of capital and revenue are crucial for any media system. Four case studies presented in this report illustrate the various ownership mechanisms used to constrain media, hide ownership, move it into the hands of proxies or cronies, and interfere in markets. They show how market forces and technological changes have challenged the financial viability of independent media.